In A Peregrine’s Path issue no. 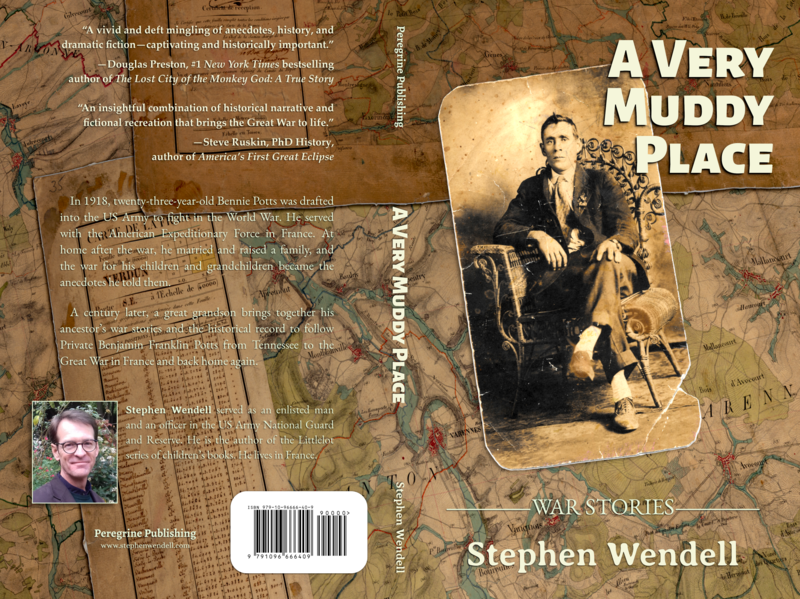 4: War Stories and Miracle Making, we see the cover of A Very Muddy Place and learn of Stephen’s plans for the year. The photograph measures 2-3/4 by 5 inches. The image shows a young man, clean-shaven, dressed in wide-legged trousers, coat, and tie. A carnation adorns the left lapel. He wears a wristwatch. He sits, legs crossed, in a chair with a high back and one arm, made of wrapped rattan. The chair rests on a thin rug. The chair’s single-armed design, according to my brief research, makes it a “ladies chair.” An open side allowed for wide skirts, and it sat low to the ground, so the lady didn’t have to bend so far to remove her shoes. On the photo’s back, in blue ink, is written “Benjamin Franklin Potts age 21 years 1915.” My cousin Bruce says the writing is that of his father, my great uncle John Wesley Potts. Also on the back, is printed “POST CARD” at the top, “CORRESPONDENCE” in the middle left, and “ADDRESS,” middle right, beside a stamp box. The stamp box is distinguished by the paper manufacturer’s name and four triangles in the corners, two up, two down. At the beginning of the twentieth century, Kodak sparked a revolution in photography with its “Brownie” camera. While the camera and the photograph were invented in the previous century, protecting the photographic plate from light made photography a tedious process. George Eastman bought the patent for roll film from inventor Peter Houston in 1889. Roll film was protected from light inside a paper wrapping. Eastman put roll film in a box camera and, in 1900, sold the first Brownies for one dollar each. Kodak sold these cameras at a loss in order to sell the film at a profitable margin. In later decades, the strategy became known as the “razor and blades” model, after the patent ran out on King C. Gillette’s safety razor and competitors began offering the same product at a cheaper price. The Brownie’s low cost and ease of use put cameras in the hands of many more people, including children. The amateur photographer was born. The Private Mailing Card Act of Congress in 1898 permitted private industry to print postcards. Also in that year, a special rate for a postcard stamp was introduced. While a first class letter could be mailed for two cents, a postcard went for a single penny. In 1907, the US Postal Service changed its regulation to allow a written message on the blank side of the postcard, which was until that time reserved for a stamp and delivery address. The regulation stipulated placement: stamp and address on the right, message on the left. Kodak also made postcard photographic paper, on which a photograph could be developed from a negative. Kodak marketed these as “real photo” postcards. Though the photo was often smaller to reduce cost, the printed paper was 3-1/4 by 5-1/2 inches. AZO was a Kodak brand manufacturer of photographic paper. The stamp box, like a watermark, can be used to date the paper. According to Robert Bogdan’s Real Photo Postcard Guide, the earliest known date for AZO’s paper with two triangles up and two down is October 1917. The discrepancy in the date suggests this photograph was developed from the negative at a later time. The photograph or its original may well have been a family keepsake during Ben Potts’s eleven-month absence—perhaps kept by his younger sister, Susie. 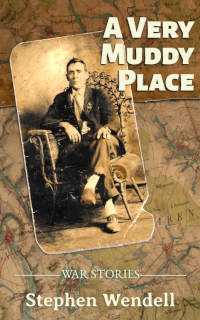 A Very Muddy Place readers will recognize the title. I read it from a PDF downloaded at archive.org. Journalist Claire Kenamore compiled the book from notes and newspaper articles he wrote while following the 35th Division across France during WWI. 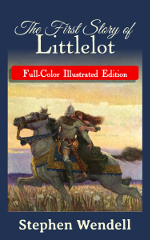 Back in St. Louis, it was published by Guard Publishing in 1919. The Klincksieck bookstore in Paris obtained a copy. Klincksieck, founded in 1842, was a German bookstore that also published and printed books at 11, rue de Lille, Paris. Éditions Klincksieck are still in business at 95, boulevard Raspail, 6th arrondissement. Sometime later, Klincksieck’s copy went to the French national library. The Bibliothèque nationale de France (BnF) is the equivalent of the US Library of Congress. I took a break from editing A Very Muddy Place today and went to the BnF. From Vauquois Hill to Exermont is not in the stacks. It’s kept in the “magasin” (library storage), because it’s, either, too valuable or not often referenced. I think the latter. I had to request it and wait forty-five minutes for it to be retrieved from its quiet place. Since I quote from it often, I wanted to hold it my hands, read a few passages, give the book some love.